This recipe was part of our family’s relatively new – and quite wonderful – tradition of Mother’s Day “Sushi.” This dish is based on a recipe I wrote years ago which, in turn was inspired by Nobu Matsushita’s pairing of monkfish (the liver of which we used elsewhere in the meal) with his Tosa-Zu sauce. I reinterpreted the sauce in a Ponzu direction and gave it a Modern Gastronomy foam treatment. Prepare the Citrus Tosa-Zu Sauce. Extract the juice from the orange, lemon, limes and tangerine. Heat the soy sauce and citrus juice in a small sauce pan over moderate heat. Remove from the heat just as the sauce begins to come to a boil. Add the bonito flakes, then cool the sauce. When it reaches room temperature strain out the bonito flakes. Make the Grissini. Pre-heat oven to 400° Fahrenheit. Melt the butter in the microwave or on the stovetop. Using a standing mixer or food processor, combine flour and salt and mix well. While mixing, drizzle in the melted butter and olive oil until well-combined with the dry mixture. Slowly add the milk, about a teaspoon at a time, until the mixture sticks together as a dough (the dough should be pliable, but not very wet). Roll out the dough on a lightly-floured surface to a thickness of about 1/8th inch. Cut into strips and arrange on a lightly-floured cookie sheet. You can curve the strips into almost any shape, as desired. Sprinkle lightly with sea salt and fennel seeds, pushing the fennel seeds lightly into the dough to secure them. Cook in the oven approximately 10-12 minutes until the grissini are light brown and crisp. Prepare the Poke. Finely dice the Ahi, Hamachi and Salmon. Finely mince the green onion, discarding the bulk (but not all) of the white portion. Combine the fish and the green onion in the dish. Macerate the Poke in the Tosa-Zu Sauce. Add 1/4 cup of the Citrus Tosa-Zu sauce to the Poke and macerate for ten minutes. Foam the Citrus Tosa-Zu Sauce. Add the soy lecithin to 1/3 of a cup of the Citrus Tosa-Zu Sauce. Foam the sauce using an immersion blender, spooning off the resulting foam at every opportunity. Repeat until you have enough for the dish. Assemble the Dish. Place a stack of the Poke in ring molds at the center of each plate. Remove the rings from each Poke using the base of a wine glass base (or other appropriately sized object) to slightly compact each stack so that it maintain its shape as the ring is removed. 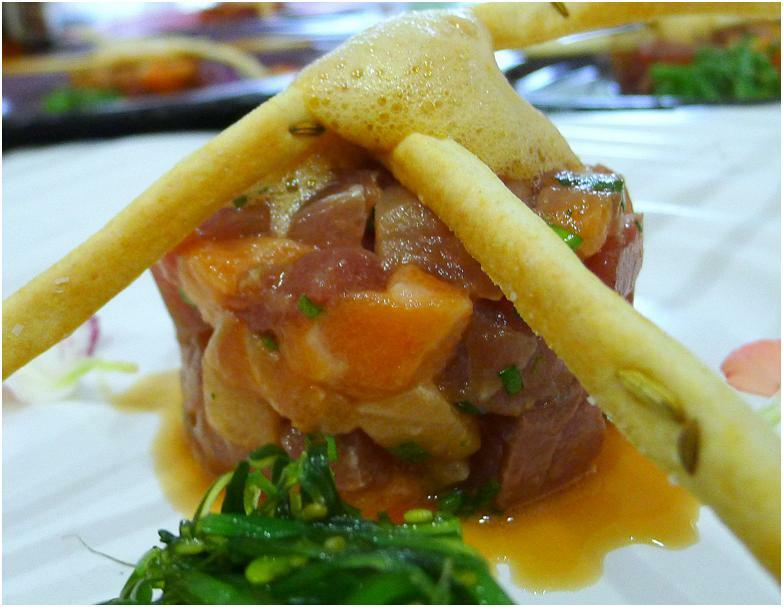 Arrange two grissini on top of each poke in any pattern you like. Top each poke with the Tosa-Zu Foam. Arrange micro-greens, edible flowers or sprouts around the plate as desired.